Regarded as one of Pakistan's most dependable Test batsmen, former ODI captain Azhar Ali has had to contend with the added responsibility of being regarded as one of the natural successors to the two retired Pakistan greats, Misbah-ul-Haq and Younis Khan. 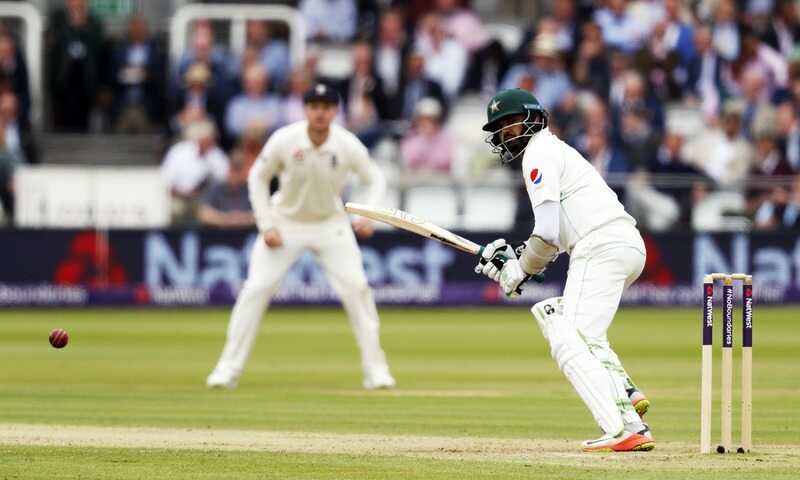 In an exclusive interview with PakPassion.net, Azhar Ali spoke about reasons behind the dip in his current form as witnessed in the recently concluded Test series in England, his hopes of playing in the 2019 World Cup for Pakistan, the need for patience to allow the Pakistan Test squad to regain its previous form, qualities that youngsters can learn from Virat Kohli and his aspirations to play 100 Tests for Pakistan. PakPassion.net: Were you satisfied with your own performance during the recently concluded Test series against Ireland and England? Azhar Ali: To be honest, I wasn’t satisfied with how I played during this series. I felt that my balance at the crease was not right as was the way I played the straighter balls during my time in England. I am currently working on improving myself in both these areas and hope to show better results in the future. Of course, one cannot take away the credit for bowling really well by England's bowlers who will always be very strong in their own conditions as they showed in the second Test match. Having said that, we also played well as we defeated them at Lord’s. We did that with a very young team and against an experienced outfit which is a very impressive achievement as well. PakPassion.net: Does constant criticism from media and fans also have an effect on your performance? Azhar Ali: As such, this type of criticism should have no real effect on a player’s performance as any cricketer has to be able to deal with such comments. However, people making such comments need to realise that no player becomes a really bad cricketer just because he has performed badly in one or two matches. His abilities are not suddenly reduced due to a temporary dip in form. In my case, there were some comments made along the lines of myself not being able to handle the pressure due to the added responsibility of becoming a senior batsman in the absence of Misbah-ul-Haq and Younis Khan. As far as the idea of the stress of responsibility is concerned, I would like to point out that I have been performing well for the past 2 years in almost every country we have played in and have scored the most runs in Tests for Pakistan in that period, so I will do my best to get back into that same sort of form in the near future. PakPassion.net: After a great start in ODIs, your form seems to have dipped, why is that? Azhar Ali: I don’t agree with the view that my form has had a dip in any one form of cricket as the fact of the matter is that my form has suffered in general in the recent past. One of the reasons for this in the past was due to a troublesome knee injury which has now improved so that I could play in the Test series in Ireland and England. I suppose, it’s now simply down to playing more cricket and batting as much as I can which should help me regain my form as well as confidence. PakPassion.net: Is the 2019 World Cup a realistic target for you? Azhar Ali: That is absolutely my target to find a place in the Pakistan squad for the 2019 World Cup. I understand that I need to work hard to get into the team but that remains my aim and it will be an honour to represent Pakistan at such a big stage if given the opportunity. PakPassion.net: It must be a great time to be a Pakistani cricketer at the moment with the team enjoying some extraordinary successes? Azhar Ali: We are in the middle of an excellent period with the number one ranking in T20Is as well as attaining success in the Champions Trophy last year. Looking back to the time when I took over the reins of the ODI team, we had a new side and at that time it seemed that our performances were not up to the mark as the results showed. But by the time I moved away from captaincy, we had quite a few players who had started to settle in and it was simply a matter of time when we would be able to improve and take our performances to a new level. Thankfully, we have now seen that elevation in the level of performances as we have now started to play so well in T20Is and of course that win in the Champions Trophy was also very special, not only for the team but for the nation as well. We are regularly winning more matches and series and I feel that our cricket in the white ball format in particular, has improved tremendously. Whether its bowling or batting, we are doing very well in the shorter formats of the game. In terms of players, there may be one or two places in the team which are still open to change but there are enough good quality back-ups available who can easily fill those positions as and when needed. So overall, we are in a fantastic place as far as Limited-Overs internationals are concerned and one hopes that this will be the case for a long time. PakPassion.net: Pakistan may be number one in T20Is, as well as Champions Trophy winners but how can they improve in Test cricket? Azhar Ali: I believe we need to have more patience as far as the Test team is concerned. You have to realise that two very senior players have left this side and like any other side in the world facing such a situation, the challenges are many for us. Any new player who comes into the side will take his time to settle in and to understand his role in the team. Make no mistake, we have some talented players, but it is too much to expect them to become a Younis Khan in no time at all. This transformation can only happen with the passage of time and a new side will take its own time to become a settled unit. Having said that, we must appreciate the fact that this young and inexperienced side came over to Ireland and England and won two Tests of the three that they played there. Let’s be honest about the fact that even winning the Test against Ireland on their own home-turf was not an easy task which this team accomplished. The entire credit for this goes to the team and if they can continue at this rate then there is no doubt in my mind that we will be back to the level of performances which we were used to before. But, as I said, a lot of patience needs to be shown by the media as well as the fans during this process. The selectors are already showing a lot of patience in the way they have persisted with some of the youngsters and have also defended their decisions with great passion which must give confidence to the selected players. We have seen the results of such confidence shown in abilities by the selectors in the way players like Babar Azam have developed over time or in the way Hasan Ali and Fakhar Zaman, although he has yet to play a Test, are being helped along to become more established players. PakPassion.net: What can young players learn from a player such as Virat Kohli? Azhar Ali: I believe the most important ingredient of Virat Kohli’s success is his determination to succeed. His composure in any situation is simply amazing. The level of professionalism that he shows in the game is comfortably the best in the game. His attention to fitness is exemplary and how he has steadily improved game year on year is just incredible. So, it’s all down to his hard-work and his desire to improve his fitness to the extent that I do not believe that any batsman in the world can match him in that aspect. His fitness is demonstrated by the amount of long innings he plays seemingly without being tired. All these qualities are great examples for any youngster to appreciate and are things that they can learn from Virat Kohli to become better cricketers. PakPassion.net: Which team do you feel will win the upcoming Test series between England and India? Azhar Ali: The prevailing warm weather conditions in England at the moment seem to favour an India victory in the Test series in my view. They are after all, ranked as the number one Test side in the world and the only thing England have in their favour is the fact that they are playing on their home grounds. England may have a good bowling attack for home conditions but in good batting conditions, the Indian batsmen will prosper and can easily put their team in a winning position when the series starts. PakPassion.net: You must have been impressed by your new opening partner, Imam-ul-Haq? Azhar Ali: He is one of the most hard-working players I have ever seen, and I am really impressed by the way he has steadily improved himself and raised the level of his game to a point that he has now been selected for the Pakistan side in two formats. He had been very good in One-Day cricket but for the last year or so, he has also been playing very good cricket in the longer format of the game. I hope that he will continue to work as hard as he is doing now and become an important member of the Pakistan team. PakPassion.net: How has your experience been of playing under Head Coach Mickey Arthur? Azhar Ali: It's been a great journey and an amazing experience with Mickey Arthur. One excellent aspect of his coaching style is that he always explains in great detail the reasons for all his decisions. This is a great quality of Mickey and something that youngsters and seniors appreciate a lot in the dressing room. On top of that, he is also producing excellent results and the team is gelling well together. PakPassion.net: Do you have the target of achieving 10,000 Test runs in your mind? Azhar Ali: At the moment, I don’t have any such goals in my mind. What I am looking forward to is to play as long as I can for my country. In doing so, I would like to reach the 100 Tests milestone for Pakistan. I have already played 65 Tests so far so there are another 35 to go before I can I achieve that goal. At that point, I will see where I stand in terms of runs. Obviously to get to any such milestone such as the 100 Test mark, I will have to perform very well and once that happens, anything is possible.